First of all, let me just say that i love the UI redesign of v3. However, the lockscreen is in my opinion, a bit too complicated. The huge functionality of the lockscreen proves to be a big strain on my phone's low ram. Most of the time when I need to unlock the phone, I have to press back, which caused the lockscreen to hang a little bit, which is kinda annoying. Is there anyway you can bring back the lockscreen of v2, or maybe just give it an unlock button? However, the lockscreen is in my opinion, a bit too complicated. What are your lock screen settings ? Did you try to disable Settings > Lock Screen > Show on Lock Screen ? Actually what I was trying to express is the lockscreen of Poweramp itself, but with the unlock button, as in v2. In the current version, in order to unlock the phone I have to press the home button for a few times, and only after 5 seconds would the Poweramp's lockscreen disappear and allow me to input my password. The new custom 'Lockscreen' is basically just the main Poweramp player interface replacing the regular Android lockscreen while music is playing. The code for old v2 customised lock view is no longer present as the rest of the interface was rebuilt completely. In this new mode you can perform most PA playback and library functions just the same as if the phone was already unlocked, except for more sensitive things like Settings, File modification/deletion, etc. 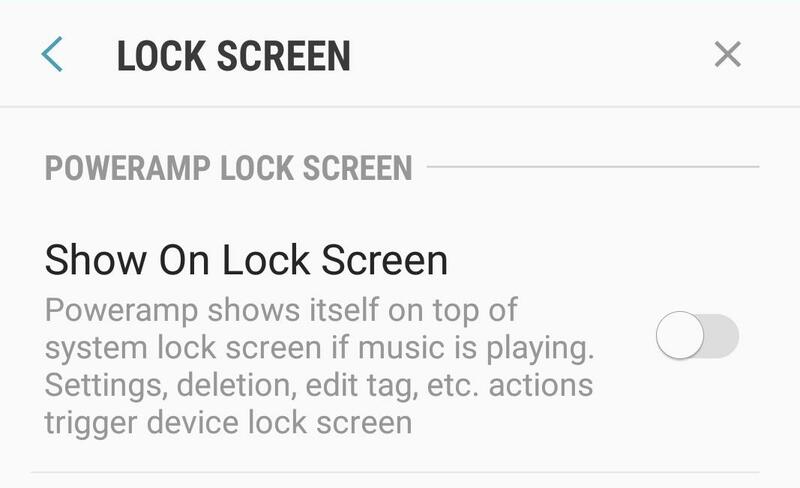 To quickly get to the regular Android lockscreen in order to fully unlock the device, just use the Back button. The regular lockscreen shows just the mini (notification-bar) control panel for PA, plus album-art if the user has requested that option. As a side-note, personally I'd prefer if cover artwork on the Android lockscreen was presented centrally in its original ratio, rather than zoomed to fill the whole screen, with a blur effect filling the unused screen space in the same way that artwork is displayed in the main player. Zooming relatively low resolution square images to fill a vertical phone screen just looks nasty.